An old barn that has been restored and transformed into a showcase for the Royal Automobile Club’s collection of vintage vehicles has been named Surrey’s best heritage conservation project. 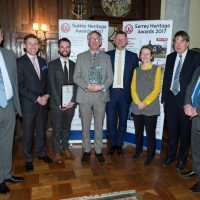 The Old Barn Motor House, Woodcote Park, Epsom scooped the top prize in the Surrey Heritage Awards 2017, organised by Surrey Historic Buildings Trust and supported by Surrey Life Magazine. The architect and design team behind the conversion of the barn received their trophy and certificate from SHBT’s Patron, Mr Michael More-Molyneux, Lord-Lieutenant of Surrey, in a ceremony at Loseley Park. Dame Helen Ghosh, Director-General of The National Trust, gave the keynote speech at the Awards ceremony. In addition to the overall winner, two building conservation projects in Dorking were “Highly Commended” by the Surrey Heritage Awards judging panel: The Hope Mausoleum, Deepdene, and Mullins Court in West Street. Also shortlisted were: Undershaw (former home of Sir Arthur Conan Doyle) in Hindhead, The Home of Compassion in Thames Ditton, and St Martha’s Priory in Chilworth, near Guildford. Pictured: The project team receiving their trophy at Loseley Park. Photograph shows (from left) Mr Michael More-Molyneux (Lord-Lieutenant of Surrey); Mr Chris Anderson (Royal Automobile Club); Mr Matt Woollven (GQA – Architects); Mr Giles Quarme (GQA – Architects); Dr Nigel Barker (Chairman of judges, Surrey Heritage Awards); Dame Helen Ghosh (Director-General, The National Trust); Mr Stephen Scammell (Sawyer & Fisher – Quantity Surveyors); Mr Paul Snoddy (RAC). Photo by Andy Newbold/Surrey Life.